In Visit To South Korea, Trump Continues Theme Of Security And Trade : The Two-Way The president says the U.S. is prepared to use "all available tools short of military action" to bring North Korea to the table, but that it would use the "full range" of military options if needed. 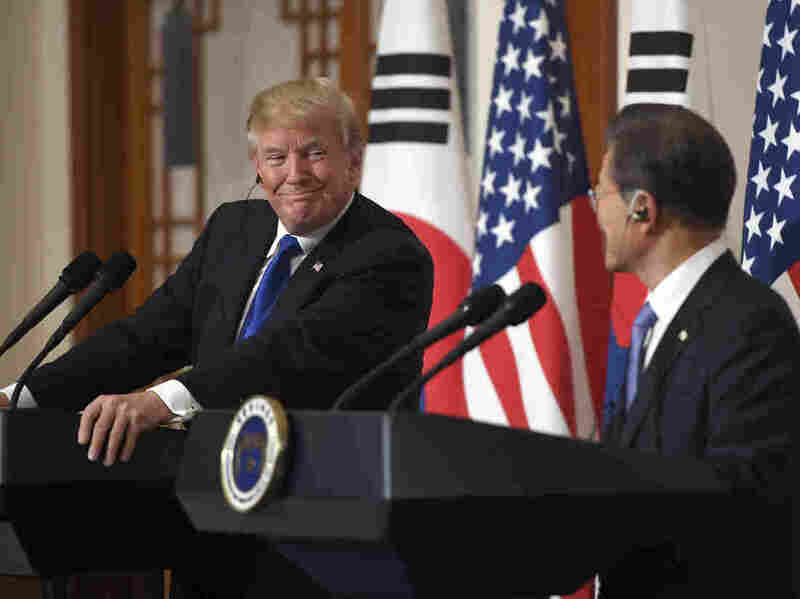 President Donald Trump smiles with South Korean President Moon Jae-in during a joint news conference at the presidential Blue House in Seoul, South Korea, on Tuesday. President Trump said the U.S. was committed to working toward a diplomatic solution with North Korea over its nuclear and missile programs, but that Washington was prepared to use a "full range" of military options if necessary. His remarks were made at a joint news conference with South Korean President Moon Jae-in held in at the presidential Blue House in Seoul on the second leg of Trump's five-nation tour of Asia. "We call on every responsible nation including China and Russia to demand that the North Korean regime end its nuclear weapons and its missile programs and live in peace," Trump said. Trump arrived in South Korea on Tuesday after a visit to Japan, where he met with Prime Minister Shinzo Abe. Foreshadowing the next stop on his trip, the president said "China's out trying very hard to solve the problem with North Korea." "We hope that Russia likewise will be helpful," he said. "If we get China, we get Russia, we have other countries we want to get, we think that things will happen and they could happen very quickly." Trump has taken a tough line against North Korea and Pyongyang has responded with escalating nuclear and ballistic missile tests, including the successful test-launch in July of an ICBM capable of reaching the continental U.S. He has also matched Pyongyang's hyperbolic rhetoric, threatening to respond to North Korean threats with "fire and fury like the world has never seen." Trump and his South Korean counterpart agree on the need to pressure the North, but Moon favors dialogue over military action against the regime of Kim Jong Un, which would put South Korea in the cross-hairs of North Korean artillery. "We're showing great strength," he said. "There's never been strength like it," adding that the U.S. had three aircraft carriers and a nuclear submarine "positioned." "We hope to God we will never have to use them," he said. He said the U.S. is ready to use "all available tools short of military action" to bring Pyongyang into compliance with international sanctions, but "the U.S. stands prepared to defend itself and its allies using the full range of our military capabilities if need be." He said they were "making progress" on diplomacy with Pyongyang. Although tensions with North Korea are a major focus of the president's trip, so is trade, the issue on which Trump aggressively campaigned. To right what he sees as unfair bilateral relationships, he has threatened to pull out of the United States-Korea Free Trade Agreement, also known as KORUS, what Trump purports is creating an economic disadvantage. Trump said the two leaders also talked trade, thanking President Moon for "instructing trade negotiators to work closely with us to pursue a much better deal, a deal that frankly has been quite unsuccessful and not very good for the United States." He boasted that the U.S. makes "the greatest military equipment in the world" and that South Korea had agreed to ordering "billions of dollars worth of equipment, which is good for them. We have already approved billions of dollars worth of equipment." Moon said the purchases were "very much needed for us to beef up our military." 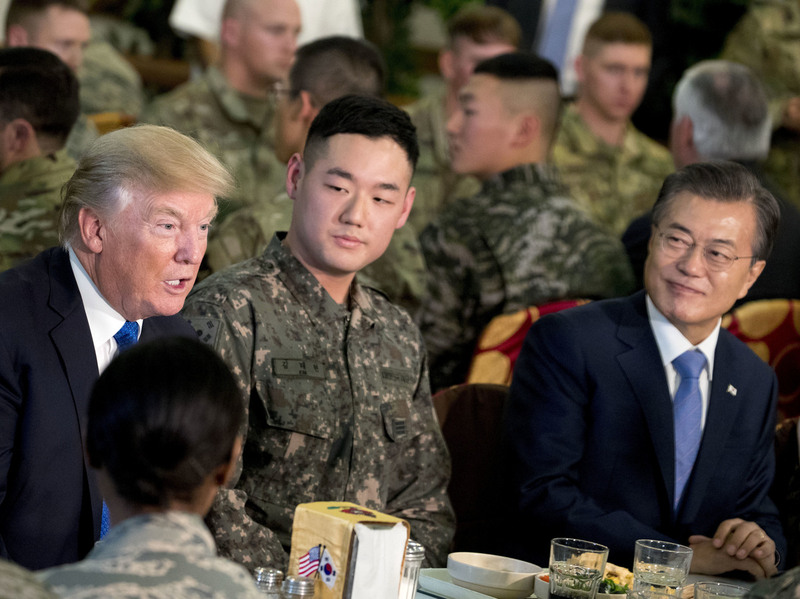 President Trump and South Korean President Moon Jae-in, right, have lunch with U.S. and South Korean troops at Camp Humphreys in Pyeongtaek, South Korea, on Tuesday. After Air Force One landed in South Korea, the president flew by helicopter to Camp Humphreys, a U.S. Army garrison in Pyeongtaek, about 60 miles from the Demilitarized Zone that separates North and South Korea. But Trump skipped a trip to the DMZ – which has become customary for visiting U.S. presidents. One senior administration official dismissed visiting the North-South border, calling it "a bit of a cliché." At Camp Humphreys, Trump ate lunch with President Moon Jae-in and U.S. and South Korean troops. "I had a choice of having a beautiful, very fancy lunch and I said no, I want to eat with the troops and we ate with the troops," the president told reporters. He said he was preparing to meet "with various generals about the situation in North Korea." "I think ultimately it will all work out, it always works out, it has to work out," the president said. U.S. and South Korean officials say the visit to Camp Humphreys is meant to highlight close military ties between Washington and Seoul. Camp Humphreys is currently in the final stages of a massive expansion set to be completed by 2020. It will be the largest overseas American base in the world, writes The Diplomat. At the joint news briefing, Trump remarked of the camp, "I know what it cost, and it's a lot of money. And I'm sure I could have built it for a lot less."